Alice in Chains is an American rock band formed in Seattle, Washington, in 1987 by Jerry Cantrell and original lead vocalist Layne Staley. The initial lineup was rounded out by drummer Sean Kinney, and bassist Mike Starr (who was replaced in 1993 by Mike Inez). Although widely associated with grunge music, the band's sound incorporates heavy metal and acoustic elements. Since its formation, Alice in Chains has released four studio albums, three EPs, two live albums, four compilations, and two DVDs. The band is known for its distinct vocal style which often included the harmonized vocals of Staley and Cantrell. Alice in Chains rose to international fame as part of the grunge movement of the early 1990s, along with other Seattle bands such as Nirvana, Pearl Jam, and Soundgarden. The band was one of the most successful music acts of the 1990s, selling over 35 million albums worldwide,and over 14 million in the US alone.In 1992 the band released their album Dirt which was critically acclaimed and has been certified quadruple platinum. The band also achieved two No.1 Billboard 200 albums (Jar of Flies and Alice in Chains), 14 top ten songs on the Mainstream Rock Tracks chart, and eight Grammy Award nominations. Although never officially disbanding, Alice in Chains was plagued by extended inactivity from 1996 onwards due to substance abuse, which resulted in in the 2002 death of Layne Staley, and the 2011 death of former bassist Mike Starr (who left the band in 1993). The band reunited in 2005 with new lead vocalist William DuVall and released Black Gives Way to Blue, their first studio album in 14 years, on September 29, 2009. The album was a success, being certified gold by the RIAA in March 2010. 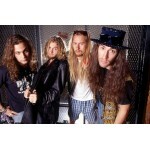 Alice in Chains is currently working on a new album, which is rumored for release in early 2012.